Unusual 55mm or 2 1/4" Amethyst spheres from Madagascar. 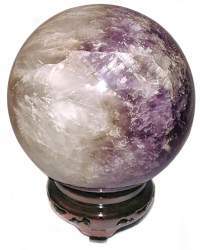 These two tone Amethyst spheres have a deep amethyst coloring on one side and contrasting milky white formations on the other side. Amethyst promotes loyalty and devotion as well as being known historically to foster sobriety. Excellent polish and finish minor cracks due to the size and nature of the crystal. The Oriental Rosewood Stand is sold separately. 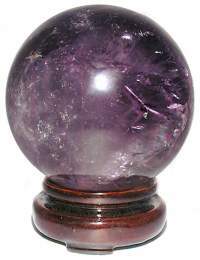 Beautiful large 3 7/8" Amethyst spheres from Brazil. Good dark color on most of the sphere with some pale and milky sections. Excellent polish and finish with some minor cracks due to the size and nature of the crystal. The Oriental Rosewood Stand is sold separately. 95mm or 3 3/4" Sphere - 2lbs 13ozs. These large 4 1/4" + Brazilian Amethyst spheres have many interesting, varied views to appreciate depending on the side being shown as the colors range from pale and milky to dark and clear. Excellent polish and finish with very minor cracks if any, due to the size and nature of this stone. The Large Oriental Wood Stand is sold separately. 105mm or 4 1/4" Sphere - 3lbs 14ozs. 110mm or 4 1/2" Sphere - 4lbs 6ozs. 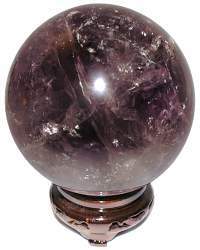 These 4 3/4 Brazil Amethyst spheres have a rich amethyst coloring. Excellent polish and finish with some minor cracks due to the size and nature of the crystal. The Large Oriental Wood Stand is sold separately. 120mm or 4 3/4" Sphere - 6lbs 5ozs. These beautiful huge 5 1/4" Amethyst spheres from Brazil have excellent translucent amethyst coloring with some pale coloring and lots of rainbow inclusions. Excellent polish and finish with only tiny cracks due to the size and nature of the crystal. The Large Oriental Wood Stand is sold separately. 130mm or 5 1/4" Sphere - 7lbs 14ozs. 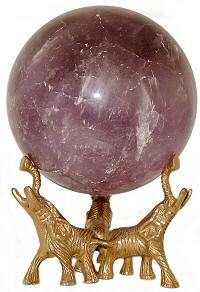 Beautiful 90mm or 3 5/8" Amethyst spheres. 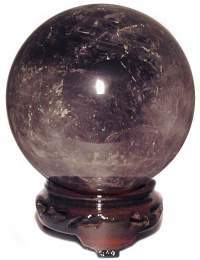 These spheres have very interesting variations in color that vary from a deep Amethyst color to small portions of clear quartz and have many areas of good clarity. 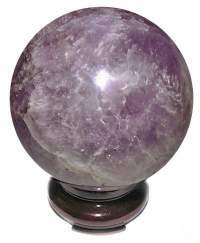 Amethyst promotes loyalty and devotion as well as being known historically to foster sobriety. Excellent polish and finish minor cracks due to the size and nature of the crystal. The Oriental Rosewood Stand is sold separately. 90mm or 3 5/8" Sphere - 2lb 8ozs. 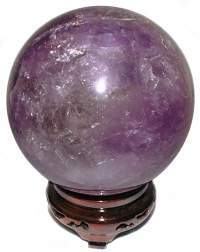 This beautiful 4 2/3" Amethyst sphere from Brazil has nice translucent amethyst coloring with a wide circular band of of contrasting milky white color with hexagon shaped amethyst phantoms and a clear center of deep translucent amethyst color. Excellent polish and finish with only tiny cracks due to the size and nature of the crystal. The Large Oriental Wood Stand is sold separately. 115mm or 4 2/3" Sphere - 5lbs 10ozs.